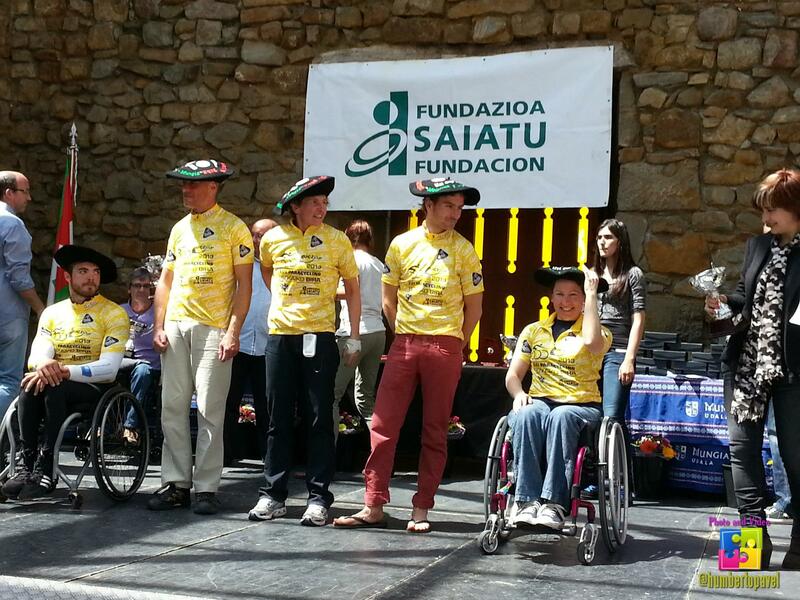 I was persuaded to participate in my first UCI Cup by my Spanish friend, Susi Rodriguez. The clincher was that the organisers subsidised the cost of the Hotel and provided transport, which meant no logistical nightmares for me as I always travel ‘solo’ to my competitions. This is not by choice, but because of financial constraints and I am grateful to Brain Alldis and Chris Madden for showing me how to put a bungee cord to good use when travelling with a hand bike, wheel bag, day chair plus luggage! The Bira races takes place in Artxanda (TT) and Mungia (RR) outside Bilbao. Now, if I had studied Geography at School, I might have realised that it is rather hilly round Bilbao…The 10.5km Time Trial elevation map showed a double dip with climbing of 211m and the Road Race of 33.5km involved 235m, with both events on consecutive days. I am one of those strange cyclists that relish a challenge, especially when it involves hills, having a good power to weight ratio, but I soon realised why there were so few hand cyclists at the event! The weather was not good on race morning, chilly and cloudy with light drizzle, but fortunately it cleared up by mid morning. Mark Rohan, Irish Paralympian, warned me to take it easy on the first uphill section and on the downhill sections of the TT, which had many tight turns. I was glad of his advice as I grinded my way up the steep inclines and flew down the steep downhills. My chain fell off as I prepared to cyle down the last hill to the finish and I managed to put it back on just before the finish line. Unfortunately, I had ‘tweaked’ my supraspinatus in my left shoulder at the BIDS swimming competition earlier this year, and my whole shoulder, neck and arm spasmed and locked up with the effort of the challenging course. Fortunately, the Fundacion Saiatu had volunteer Physios on hand to massage and tape my shoulder for the following day. I had further problems in the Road race the next day when the ratchet in my gear shifter broke half way round, which meant I was stuck in a high gear for the climbs. Despite the set backs, I finished first in both races and was ‘crowned’ overall Champion with a rather charming felt ‘chapella’. The pain from my shoulder was made bearable by the enormous hospitality and friendship at the after race prize giving and lunch provided by the organisers. I was even ferried to a Rehabilitation Centre the next morning for some more Physio treatment before my flight home, carrying a yellow jersey, three bottles of wine, a trophy, a medal, flowers and of course, my hat!